One thousand years ago, the Extraordinary Wizard Hotep-Ra prepared to leave this land for the last time. Hunted three times around by his ancient enemies, it was now time to fight. 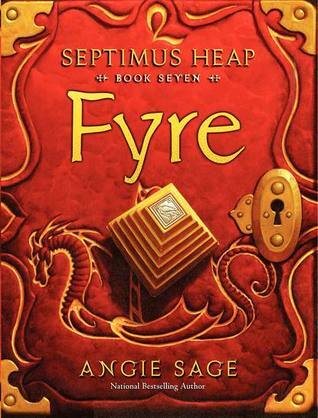 In the novel Fyre by Angie Sage, Hotep-Ra has made of the preparations he needed; the Wizard Tower filled with Magyk, a system of Quests given to the best and brightest apprentices to gain news and give advice when he is in his timeless House of Foryx, where he will rest for the next thousand years, but the time for preparation is over. Hotep-Ra intends to fight the enemies alone, but the Queen, his advisor and friend, had other ideas. As the Darke wizards flew out of the clouds, the Queen shot them both in the heart with her crossbow. Although they simply sealed the wounds, the wizards swore revenge on her and her ancestors. A mighty battle ensued, ending only with the Queen Committing them in her ring, imprisoning them for a thousand years. This ring changed masters, gaining the Darke powers of the masters before it and giving them to their next master, wreaking havoc on the Castle, the living place of the Queen’s descendants. One thousand years and seven hundred seventy five Extraordinary Wizards later, Septimus Heap and his master, the Extraordinary Wizard Marcia Overstrand, have captured the Two-Faced Ring, with the help of Beetle, the Chief Scribe, Jenna, the Queen in waiting, and Marcellus Pye, the Alchemist, who plans to DeNature the ring in his Alchemical Fyre. However, the ring is waiting. Waiting for revenge. Waiting for the right two people. Waiting to be free. Overall, the whole Magyk series is fantastic, like the plot, cast of characters, and the backstory, but the depth of this book really surprised me. This book went into the details of the castle’s past, like with Hotep-Ra’s final battle, and the Two-Faced Ring causing even more havoc in the past. They incorporated this even when the book mentioned the past one thousand years ago, and how the two darke wizards caused a tragedy in the past, even before any of the books were set. The depth in which the book describes the backstory of the castle, finally unlocking many of the secrets that have plagued readers in the first six novels, and tying up all the loose ends from the other books, like with Wolf Boy, the first male witch. The social interaction between the characters, especially between Jenna, the Queen in waiting, and Septimus, the Extraordinary apprentice, fluctuate a lot and are very intriguing. The plot, with old enemies trying to work together to defeat a common foe is a bit cliche, but is done well anyway. Overall, I highly recommend this book, and it’s series, to other readers.